As most of you know, I've been deliberating over what to do after next July...should I stay in Japan another year? Should I move on to another country since I'm young and have the freedom to explore the world? Should I come back home to America? If I do go back to America, where should I go? These questions have been on my mind pretty frequently lately. I know the decision doesn't have to be made until February, but mostly for my peace of mind, I want to know what my plan is. As I've thought it through, I realized that staying in Japan would be the easy decision. I have an apartment with cheap rent, a car, a good paying job that allows me to pay off student loans, a good social network and an opportunity to live in a foreign country. Having said that, it would be only that, the easy decision. You would think that it would be harder for me to decide to move to a foreign country, not to move back home, but I've found that not true. When I decided to come to Japan, I was at that point in my life where I had to change everything no matter what -- I graduated college, needed a job, and no matter what I would have been going through a major life change and move. Now however, I'm just starting to feel settled in with life, and by coming home, I'm creating a disruption to that "settled in" feeling. As I've realized that staying in Japan would be the easy choice, I've also realized that it's not the best choice for me. I have become somewhat complacent with my life in Japan. Yes, it's been a great opportunity for me and I have grown a lot in my time here. I've seen great things and met some great people. But in all honesty, I'm not challenged by my job here and I have lost most interest in learning Japanese since I know it won't be all that relevant to my life back in the US. Of course I am still interested in foreign culture, but anything that I haven't learned or done in two years I probably wouldn't do in 3, and I have had to come to terms with that. So it's time to move on. I can't promise that I know what that entails, just that I am not signing a contract for a third year on the JET program. In all likelihood that means I'm returning home, but I make no promises. There's a small chance I'd go somewhere else (trying to get an international teaching job in Peru? ), but I stress the small. Deciding to leave my job here was a big enough decision for now...it means re-doing my resume, applying for jobs, finding a new place to live, deciding where to live, and overall analyzing what my goals in life are...big questions that do not have easy answers. And of course, making the best of the time I have left in Japan, almost exactly 9 months. The time is going to fly, and though I need to look forward and plan for the future, I also want to make sure to stop and take in the opportunities around me because I'll never get this time back or anything like it. Glad to hear you've made a decision- it's a scary one to make! If you need any help with the transition, I'm your girl! 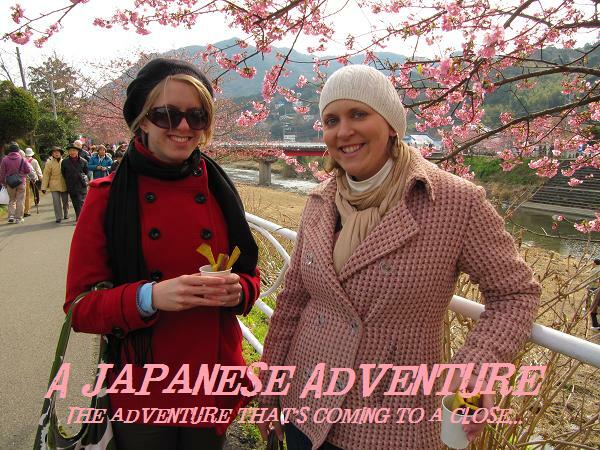 Dawna and Ashley Do Tokyo!